We had our interviews with President Lee this week!! Mine was all about boys which was about as much fun as you can imagine. We had a great district council though after that. Sister Anderson and I got to train about the importance of working with our members. Honestly, I love working so closely with members of our ward. They make it easy because they're kind of the best. It was fun to train with Sister Anderson! 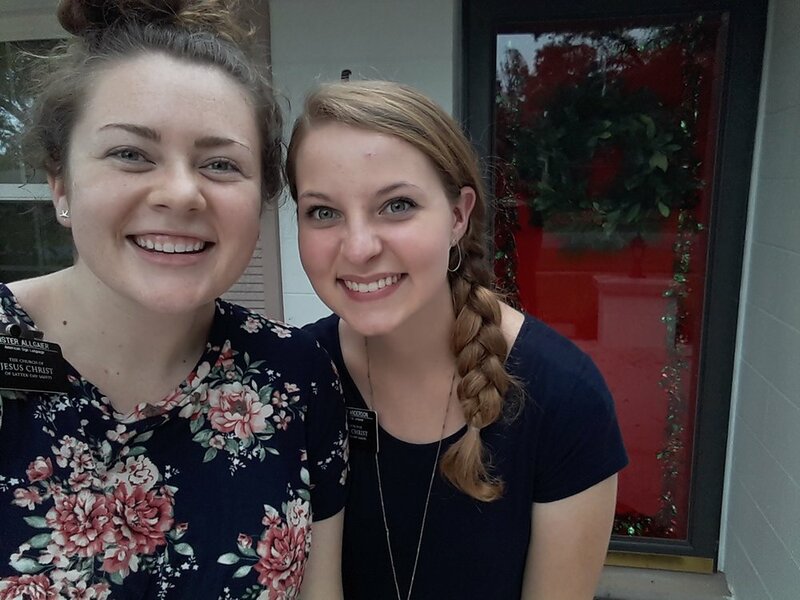 She is such an incredible missionary. On Thursday, we had our misison wide Christmas party!! We started with skits from each zone and it was hilarious. My life was made complete when President Lee and the assistants came out in light-up-llama-Christmas onesies. I could die happy now! It was so funny!! Our skit was a blast. Then we had lunch and moved into the chapel for our music devotional. Before we started that President surprised us by having all the departing missionaries give their last testimony in front of the mission. Never fear, your girl held it together and didn't cry. I have grown a lot!! 😉 I sung in a few of the musical numbers and I'm grateful I did. I love music and the spirit it brings. It was really fun to see all my friends and be able to say goodbye to all of them. I love them so much!!!! I finally got my chance to serve in Jacksonville that day when I went on a trade-off with the one and only SISTER DANIELS!?!?!?! Who would've thought that would have happened!!! It was a blast. We got to see how much we had both changed over the last 18 months. It was a blessing to be with my best friend. 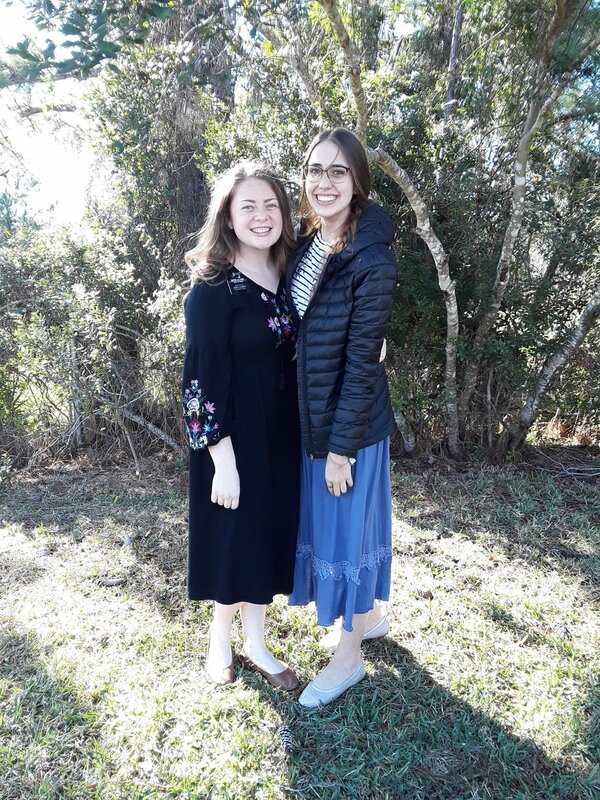 On Saturday, Sister Anderson and I spent her birthday (welcome to the old folks club of 21🎉🎁🎈) in Palatka for a split/blitz. I went with Sister Garcia which is pretty hilarious and here's why: she does not have a license and mine expired when I turned 21 so neither of us can drive. Which meant we biked. Like a lot. We went to lunch with the other sisters and then we biked to our next appointment. Which meant straIGHT TWO HOURS OF BIKING. I CANNOT FEEL MY PATOOTY. That is all I will say about that experience. Y'all I have loved these last 18 months so much. I hadn't always liked it, I've had some really hard days. I have had so many experiences that I almost wished I hadn't. However I am very much aware "that all these things shall give thee experience, and shall be for thy good." (Doctrine and Covenants 122:7) I am so blessed to have been able to serve and love the people of Florida and represent my Savior. I love Him with all my heart. I have been reflecting on the greatest thing I have learned and I know that God is our Father in Heaven and He loves us. I am a witness of His love. This church is true and the gospel of Jesus Christ has been restored. It's here and when we abide by those principles, we can be happy. This is the happiest I have been and it's all because of Him. I love being a missionary. Do you even have comp unity if you don't match at the Christmas party?? I love my companion so so much. She is a blessing to me. Posted on December 17, 2018 by Kevin Allgaier. Another blessed week here in St. Augustine!!!! What a place to be during the holiday season. I stinkin love it. This week was crazy busy but what week isn't!!! Here are some highlights! Highlight 1: TRADE-OFF WITH THE SISTER MORSE!!!!! This killer sister has been out for just over 9 months and she is sooooo good. We knocked 1473828374 doors with no good fortune. She was a trooper! Finally we decided to try one last door before we skipped on home for a lesson. We tried to see Megan who I found and taught my first round in St. Augustine! She answered and she let us teach her again! This time she's got a baby! It was such a miracle! We also got to have a lesson with a recent convert in Orlando!! He's deaf, so we are lucky enough to teach him. Sister Morse was a champ to sit during that lesson and deal with my horrible voice interpretting skills. I love that woman. Highlight 2: WORLDWIDE DAY OF SERVICE!!! Yesssss let's GOOOO!!!!!! 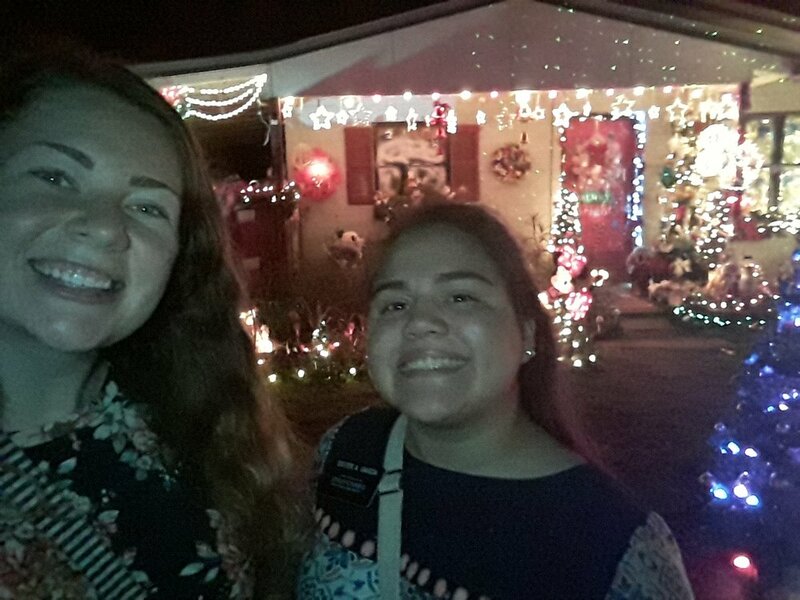 Sister Anderson and I did some Christmas service and decorated others houses for Christmas. 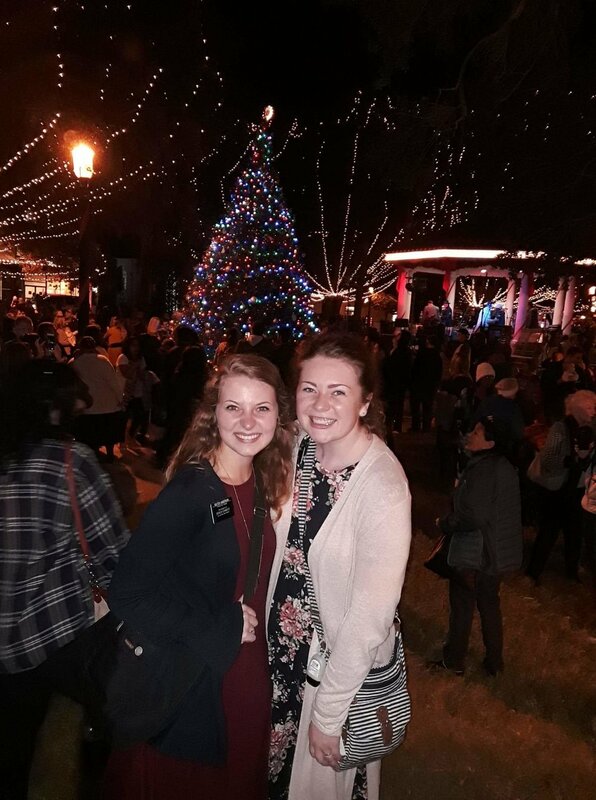 I love #LightTheWorld and so should you. Go look it up and participate! Don't be a party pooper. Highlight 4: Tis the season for caroling!!!!! I stinkin love spreading Christmas cheer for all to hear. We went as a district and it was a party and a half. Out of tune but good otherwise. We had one woman give us a box of truffles (pray for my waistline)! Another gave us her family's Christmas card since we gave her own of ours (a #LightTheWorld card)! I love this place. Alright fam!! I LOVE y'all!!! You know, it's suprisingly hard to figure out how to spell deja vu.... But it's the only word that accurately describes my week. It feels so surreal to be back in the beautiful St. Augustine Shores area!!!! Churhc was so funny. Some of the members couldn't quite figure out how they knew me so there was a lot of awkward stares. Good thing awkward is my forte. 😁 I love these people so stinkin much!! We are teaching some seriously elect people!!! Good night I love being a missionary. We are teaching this woman named Amanda. She wants to follow Jesus Christ and be baptized!!! She's incredible. For all the true fans, you'll probably remember one of my most fav people Morgan. Turns out she's being taught by the sisters again!!! Imagine her surprise when I showed up on her doorstep. It was cute. Ah I love her. Last year, I got to got to go to Night of Lights in St. Augustine. For all my Utahans, it's kind of like Temple Square lights. It's a big deal. It was so fun and we handed out so many #LightTheWorld cards. I am so lucky because I got to go again on Saturday!!!!!! LITERALLY SO MUCH FUN!!!! After we finally parked and got out of the insane traffic, we had about 40 minutes to blitz downtown st. Augustine. Sister Anderson and I made a goal to hand out 20 card to 20 people. We not only handed out 20 but 22!! I loved being able to talk to so many different people in such a short amount of time. It was a blast. OH MY LANDS. I FORGOT. 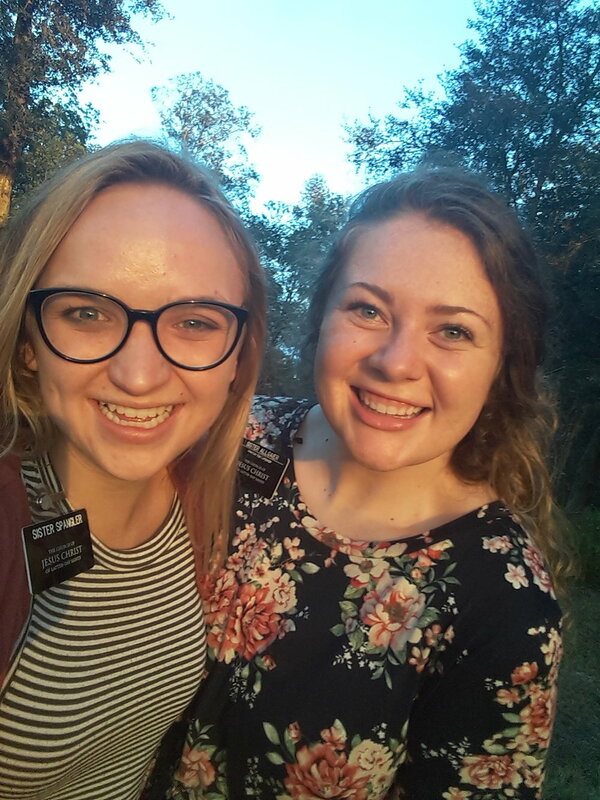 Let me introduce you to the one and only SISTER ANDERSON!!!!! These past few days have been a BLAST with her!! She's been very patient with my constant outbursts of "OH THIS IS SO WEIRD" and my "wait I know that person!!" She is so fun and I'm such a lucky lady to have her as my companion!!! Posted on November 20, 2018 by Kevin Allgaier. Hey it's fall y'all!!! I know it's been fall for a minute but it's FINALLY starting to cool down enough where if we pretend the ground has leaves on it, it feels like fall. Cute Sister Clark and I ate our weight in tators, creamed corn, fried chicken and all sorts of bad-for-you-gooodness on our trade-off!! Welcome the newest member of the Church of Jesus Christ of Latter-day Saints, Kay!!!!! Posted on October 29, 2018 by Kevin Allgaier. Sister Knudsen and I are living breathing testimonials of what we call "stress zits." After spending wayyyy too many hours decorating the wedding cakes and many nights belting out Josh Groban's "You raise Me Up" so I could be prepared to sing the wedding song with a TON of prayers, we finally did it. Kay and Claude are hitched!!! All-in-all it was a beautiful ceremomy and we are soooo happy for them!! Next stop: baptismal font! Kay is getting baptized by her new husband (aw cute) this Thursday!! Ah this couple really is the greatest and we are so blessed to have them in our lives! G O L D E N!! We also had zone conference where we were told we are all getting new kitchen appliances!!!!! You may now call me an adult because I have never been more excited about bowels and knives in my entire existence. Posted on October 22, 2018 by Kevin Allgaier. This has been the funniest week so far and I'm PUMPED for the next 5!!! Our transfer motto is "This would be awkward if we didn't know each other." When you are first with a companion you don't know, it's kinda weird. Normally one just has to toot or something to break the ice but it's a solid 3-5 days of awkwardness. Thankfully, because we already know each other so well, we skipped right over that! We hit the ground running and we don't plan ofn stopping. G.E.N.E.R.A.L. C.O.N.F.E.R.E.N.C.E Holy cow, we are SO blessed to live in a time where we have a living prophet with apostles and leaders to help guide the church!! I love being able to hear their counsel for the next 6 months! Something that really stood out to me this conference is the emphasis on families. In the church's document, the Family: A Proclamation to the World we learn that "The family is ordained of God." It only makes sense that God would provide instruction and direction to better build unity and faith within the home and in our families. 2 hours of church is a HUGE change but I know it's for our benefit! I'm so excited to see how we can better our gospel learning in the home. Confernece in bed. What more could you want? It is my pleasure to officially introduce you to our vehicle: this is, The MommyMissile!! I am the missions minivan mom and I am proud. Posted on October 8, 2018 by Kevin Allgaier. Sister Topham is literally the greatest sister being ever!!!! I am such a blessed woman to serve with amazing sisters! I loved this exchange so much. She has the biggest heart! I love her. We had some really spiritual lessons. This girl knows her scriptures my goodness. She's a bomb.commissionary. We found out that DQ had their fall shakes in so we had to go and try it out. I had Pumpkin Pie and Sister Spangler had Snickerdoodle Cookie Dough. It was 110% worth it. Sweaty: We had zone conference this week. Elder Shurtliff and I sung a duet for the musical number! I'm grateful for people who do things that I tell them to even if they don't want to. 😇😇 If you want to listen to the prettiest song in the world, look up Peace, Be Still by Nate Noble. That's what we sang and I love it with my whole soul. August 27, 2018 - The Week of the 10?! I LOVE this week!!! Hold tight, it's a wild one. We had a killer week!!! We went to go see a woman we had been working with. She lives in a very sketchy place so people are always in and out of her house. Because of that we were able to hold an impromptu scripture study and found 10 new people to teach!!!! Y'all, lake city is B L E S S E D.
This week I was studying happiness and I learned that there are 4 things we can do to increase your happiness. Get your notebook and pen out cause these are good. I PROMISE you that this is true. Happiness is so attainable!! Even when you're sweating in August in Florida on a bike, in a skirt. Elder Shurtliff thought it would be a good idea to put a snake on me 🙃 If you look closely you can probably see my tears.... don't mind the double chin. It only comes out when I'm scared. Perks of going to the other side of the mission for a minute: SIS NEWMAN!!!! 1) I flipping love my companion. Sister Winona is literally an angel in Cinderella's body and I love her with my entire being. 2) We had our leadership council this week and I saw all my best friends!!!! I'm a happy camper. We learned lots of good things as well so don't worry. 3) We met a lady named Cathy and she told us we could call her "crazy" if we so desired. We desired to do so. Miss Crazy Cathy has had a rough month so we sang to her and cheered her up a bit. During our conversation she says "there's something in my pants besides me!!!!" Miss Crazy Cathy starts doing the ants-in-your-pants-dance!!! Man, I stinking love the south. 5) On the topic of sporting, ya girl is killing the frisbee game!! We play ultimate frisbee (it's a real thing I promise) every Friday morning with our district and I rule the field. It's fine. 6) CANNON CREEK IS THE GREATEST PLACE EVER!!!!!!! I love the missionaries I get to work with, I love the ward I'm serving in, I love my stinkin companion and I love my friend Jesus who is helping me every single day. I am so grateful that I get to serve here in sweaty, humid, stinky, swampy, buggy Florida (not sarcastic). It's a blessed land and I'm a blessed woman. This is Poke and he turns 99 years old this week!!!! Posted on July 23, 2018 by Kevin Allgaier. Y'all I am one B L E S S E D lady!!!! Sister Winona is a walking angel. We are having a total blast but also getting cr*p done. Cannon Creek is sooooo good and I love it!!! 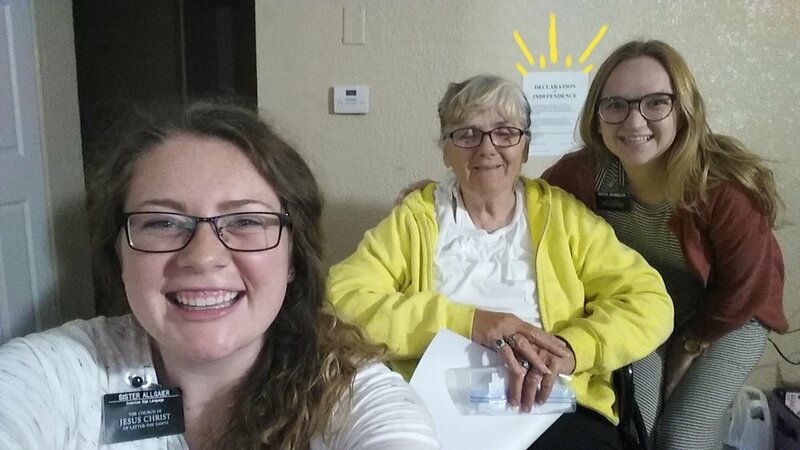 We have a goal to find one new deaf person that we can teach (Sister Winona is having me teach her the celestial language of American Sign Language). We decide to go to this area to do some finding and we saw a "Deaf Person in Area" sign. You bet your buckets we knocked that whole neighborhood. We saw SOOOO many miracles!! We found 2 new friends to teach and they are so sweet. But no deaf people yet. We are determined though so I'm not even worried. I seriously am loving that I get to serve with my bestie and help her finish these last 6 weeks of her mission strong. This is the greatest and I will give more updates next week!!! Marina was BAPTIZED on Saturday!!! I am so stinking proud of that kiddo. It was a process but man was it worth it. When she was coming out of the font she said "I did it! I did it!!" She was so happy!!! I love that girl. Transfer call has come and gone and my time here in good ol' Gainesville has run out. I have loved serving in this B L E S S E D land! This is such a good good area and the ward is so great. My companion. Oh my gosh, my companion y'all. She is the greatest human (even though she spent the last week throwing balls at me while I sleep... thanks for sending them dad 😒) and has become my bff. I love her dearly!!! 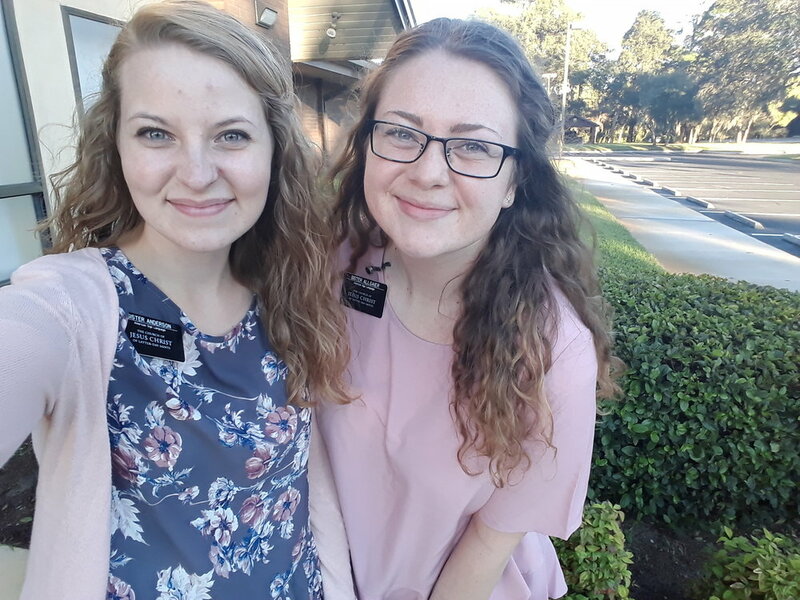 I will now be heading to Cannon Creek to serve as a sister training leader (STL) with the legend........hopefullyyouarentlactoseintolorantcauseherecomesthe......dairy SISTER WINONA!!!!!!!!!!! Holy I am stoked to be that lady's companion. She is an angel and I love her so much. It's going to be soooo good!!! Okay so other than that , I think that's it. At least I can't think of anything else. I love being a missionary here in the FJM!!!! It is by far the best mission in the whole world. I looooove it and I LOVE serving my Heavenly Father everyday!!! It's the happiest job in the world. My baby girl Rhianna came to visit me!!!! All the heart eyes. Posted on July 9, 2018 by Kevin Allgaier. July 02, 2018 - The Week of A Year in FL?!?!? Y'all. ONE. WHOLE YEAR. Time is flying. I'm talking breaking-the-sound-barrier kind of flying. I can hardly believe it! But I love this work with my entire soul and being!!!!! It's been a hot minute (again) since I've written weekly but I promised my parents I would send one. You're welcome. This week has been a blast! We went on trade-off's with our STL's, S. Beecher and S. Prue! It was so fun but I am so grateful to be back in my area with my beautiful companion. She's kind of the greatest (even though I have to force her to hug me). Florida is a blessed land folks and Gainesville is where it's all at!!!! We met this super nice lady this week who is the best neighbor ever. We were asking her about a former who lived next door to her and she literally knows everything. Which is huge cause in the south no one knows anyone. In fact, she knows her neighbors so well that when her one neighbor didn't bring in their trash bins after trash was picked up, they called the police. Turns out he had had a stroke and no one knew! I strive to be like this woman. She's my new role model. God was so good this week even though it's aprox 728373 degrees outside. I would only ever get this sweaty and this many bugs bites for God and His work. That's how much I looooovvvveeeeee being a missionary!! I'll post some pics that prove it. Posted on July 2, 2018 by Kevin Allgaier. 3) Bob quit smoking!! Do y'all know what that means?!?! 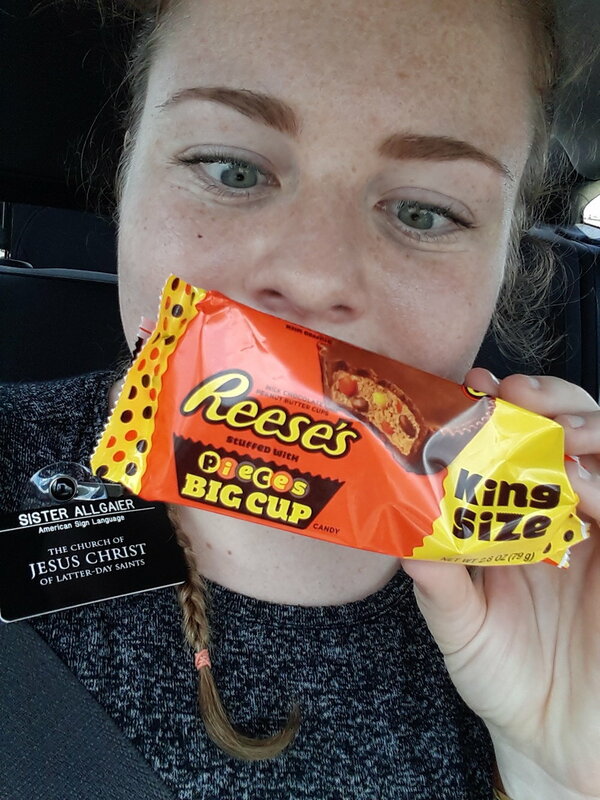 Sister Allgaier quit eating chocolate. That's right folks. If Bob can quit smoking, I can quit chocolate. Easy pea(please pray for me)sy!!! He's doing so good though. I love that man. Okay well that's a wrap, I guess not as much happened this week as I thought. Oh well. Enjoy some pictures! Love y'all!! Posted on June 18, 2018 by Kevin Allgaier. Settle in kids, this one's a long one. Bob was found by the YSA missionaries a few months ago. Since he is not in the YSA age range, they gave us a call and over to Bobs we went. We knocked on his door and he yells "come. in." We opened the door to find a man, with tattoos galore and wheelchair ridden. We learned that Bob had stage 4 MS at age 38 (that's REALLY young). Ever since then we have been teaching Bob. I am so so blessed to have been able to watch him change so completely. He is a different man now then when I first met him. He wants to be baptized, he believes what we teach him and he has been wanting to come to church. 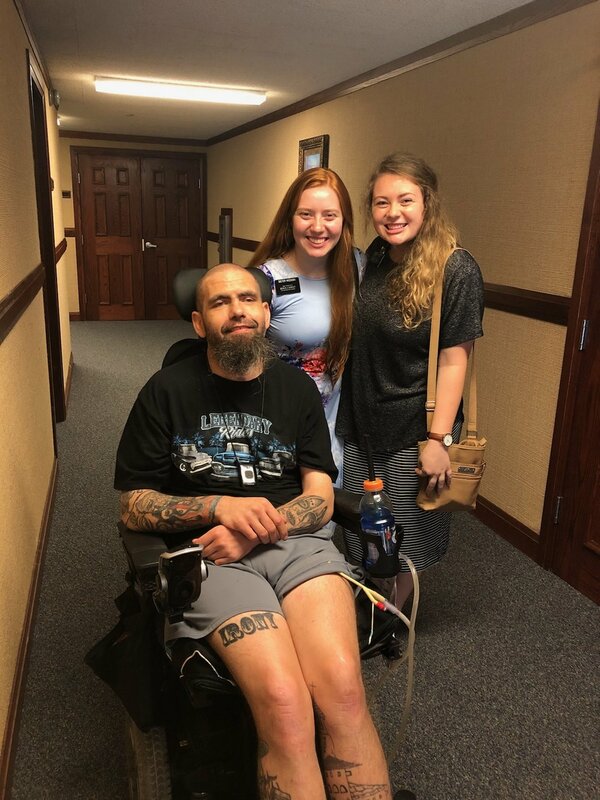 After so many prayers from him, us, the ward and so many others from home Bob was able to come to church yesterday!!!! It was a huge ordeal trying to find him a way to get there so I won't bore you by sharing all of it but I will tell you that I have never seen so many people go outside their comfort zone than I did yesterday. Grown men lifted Bob, fed him the bread and water during the sacrament, people who had never seen him before came and talked to him, children were in awe with his wheelchair. I am so proud of the Gainesville 3rd Ward!!! It was simply beautiful. Okay, enough with the sappy Sister A geez... I'll tell you some one-sentence funny stories so you don't talk asleep reading this. 1) Sister K was the object of affection when she was asked "can I kiss you?" 2) We recieved a watermelon from a man named Steven. 3) Tug-o-war with a vine through the top of a door with a deaf man is a great way to spend some time on a Saturday. 4) Teaching girls aged 6-12 The law of chastity is my new favorite pasttime. 5) When someone asks a missionary to watch their missionary's coming home video, don't do it. It will make you sad inside. 6) The best voicemail we received this week was "It's ya boi, Elder S*****." Gotta keep those privacy rules. Sidenote: it's Mama A's bday this week!!! 🎉🎈🎁❤ That also means a year ago this week I was set apart to be a missionary for the Church of Jesus Christ of Latter Day Saints and man alive do I love that calling!!! I can't believe it's been a year!!! Posted on June 4, 2018 by Kevin Allgaier. Well I wasn't going to write y'all a weekly but due to some unfortunate circumstances (we were in even numbers with the elders at the church (big no-no) so we have been banished to our car) I now have some time do either write an email or sit and watch the rain. Though I love the latter, the former might be a bit more productive. I have learned a lot this week. I'm not going to lie, this was a hard week. We had our ups for sure but our downs seemed to take the cake. I won't go into detail because I don't want to make this email sad but I did want to tell you want I learned from this week. I can do things on my own. In fact, I can do some pretty good and even great things on my own. Miracles, however, are only bestowed by God. Nothing I do will change that. Of course I will work hard and do everything I can do help those miracles happen and sometimes it feels like I've done pretty well with making them happen. But God is the one who is all-knowing. He is the one in charge. That sometimes stresses me out (thanks inner control freak) but there's a scripture I'm pretty sure I've shared already but it always calms me. My first AP shared this with me in my first transfer and I fell in love with it and memorized it as fast as I could. "Therefore, dearly beloved brethren, let us cheerfully do all things that lie in our power; and then may we stand still, with the utmost assurance, to see the salvation of God, and for his arm to be revealed." I have a hard time with giving up control but the mission has forced me into submission to God's will. It doesn't sound like a positive thing but I've learned it really is! Because He is all-knowing, I need to rely on Him. We plan for hours on end for those we are teaching and I have no idea what they need. I don't know what will help them. I can make a logical guess but God knows EXACTLY what they need. If I rely on Him and in humility, ask Him for help, He will provide answers. I've been so humbled this week. And I'm so grateful for that. Posted on May 28, 2018 by Kevin Allgaier. Okay y'all, I did not send a weekly last week because I truly had no desire to. BUT I am repenting and sending one today. This week has been so stinkin rainy and we are L O V I N G it!!! The humidity is down and so is the temperature so we are more than okay with getting a little soaked. Totally worth it. One of my favorite experiences this week was trying to communicate with our only Portuguese-speaking member about our Portuguese-speaking investigator. Eu não falo português. Never have I ever been more grateful for Google translate in my life. Where is Syd, Mads and all my other beautiful Portuguese-speaking friends when I need them? It was quite hilarious to watch us communicate with him, I must say. Let's talk about desperation. I thought I knew desperate. Turns out I only knew what desperation was when talking about finding a dress for prom a week before prom (one of our investigators just went to prom so it's on the brain). True desperation is when you have been working your bootay off for the whole week and you still haven't found a new investigator and it's Saturday. Sister K is literally a champ for putting up with all the things I put her through. We didn't have a meal appointment Saturday so I decided to make some lean butter sandwiches, grab the pretzels and nutella and work through dinner. My theory was this: if we work through dinner, God will see our desperation and dedication and will bless us. And bless us he did!! We found some AMAZING people to teach!! It was such a blessing. Nevermind we were so tired our eyes were rolling into our heads. Nevermind that night everyone and their dog decided to call and talk to us. It was a stinkin' good day. Okay my scripture for the week is from Miss Macayla Elwell (rip). "And this is the account of Ammon and his brethren, their journeyings in the land of Nephi, their sufferings in the land, their sorrows, and their afflictions, and their incomprehensible joy, and the reception and safety of the brethren in the land of Jershon. And now may the Lord, the Redeemer of all men, bless their souls forever"
Dr. K was the real MVP. She kept fixing my bandaid from when I WRECKED my ankle on a door. Posted on May 21, 2018 by Kevin Allgaier. So let's talk about this past week instead of dwelling on the sweatiness that is to come. We had zone conference this week!!! It was SO GOOD. I was missing all my friends (since they decided to hop on over to the other side of the mission) but we promptly made some new ones. I am definitly an oldie of a missionary now because I know approx 4 missionaries. Give or take. We talked a lot about member missionary work! It's so so important in doing missionary work so I'm grateful for that reminder. I have more funny stories this week but for the sake of your time and your interest I will tell you two. 1) We had just found a new investigator and were driving away. Cutie Sister K was navigating me and got a little turned around and we ended up on the freeway going the opposite way we wanted to go. Which, would have been fine except there was N O E X I T S. We were heading out of town so fast. We told our zone leader we were accidently leaving our area and we were so sorry about that. Poor Sister K felt so so bad but it was more funny than anything. She just kept looking at the map and saying "AH WE ARE ALMOST OUT OF OUR AREA!!" Eventually we found an exit and booked it back. Thankfully we weren't in St. Aug cause we for sure would have left the mission. Then, the whole way back she just kept saying "I'm so upset!" It was kinda funny. 😂 Ah... good times. 2) I almost killed my daughter. True story. We were out seeing a part-member family that lives out in the boonies. I had finished reversing the car to leave and Sister K had just gotten in the car when a dragonfly made himself at home on the dashboard. I do not like bugs. Let me repeat: I DO NOT LIKE BUGS. I panicked and jumped ship, leaving Sister K in the car with the gigantic dragonfly. During my screaming and fleeing I forgot to put the car into park. Not only did I trap her in the car but the car was now moving and I was not in the drivers seat. Oops. She freaks out and flings the car into park all while yelling at me. Turns out one of us can yell and shift gears and it's not me. But all is well and we got the bug out. She now knows that I'm not playing when I say that I do not like bugs. For my next trick, I'm going to try to bring the spirit back into this email with some thoughts I had this week. I was studying yesterday morning and preparing for church when I came across a verse in Alma. Alma was the high priest at the time as well as the chief judge over the people. He decided to give his position as chief judge over to Nephihah (weird name I know, stick with me) so he could focus entirely on preaching to the people as the high priest. In Alma 4:19 he says "seeing no way that he might reclaim them save it were in bearing down in pure testimony against them." I have gained a testimony of so many things on my mission so far but the power comes in bearing PURE TESTIMONY. I love having the opprotunity to bear my simple testimony to everyone I meet. Think about your pure testimony and how much it means to you. I promise if you bear it, it will grow. We just had testimony meeting but do it next month! It will benefit you and everyone else. I love, love L❤VE being a missionary. The pure joy and love of Christ is so real to me. I hope y'all have a STELLAR week and make sure you express your love to your mama on Sunday. I know I will (!!!!!!!!!). Love y'all!! We weekly planned at the pool...fun, but will probably never happen again due to the amount of bare skin. Fantasia is now learning from the YSA... I would be sad but she is way too stoked for me to be sad. I'm the embarrassing mom and I LOVE IT. Posted on May 7, 2018 by Kevin Allgaier. Y'all I hope you're sitting down for this one....this could potentially be a llooooooonnnngggg email but I'll try to keep it on the shorter side as to not make y'all fall asleep wherever you happen to be reading this. That would be embarrassing for you. 🙃 We will start our story on Tuesday.